The Pacific Canada Heritage Centre – Museum of Migration Society is a non-profit society with the goal of building a wider and improved understanding of Canada’s history and growth through intercultural explorations of historic and current trans-Pacific immigration. Our mission is to establish a Museum of Migration at a site of historical significance for Canadians whose families first arrived in Canada through its western portals as well as for migrants who crossed from the east, and to create a supporting national research network for an interdisciplinary and more inclusive interpretation of Canada’s history. Since our inaugural Symposium in 2013, we have launched our new website and proceeded to explore and form partnerships to the museum. 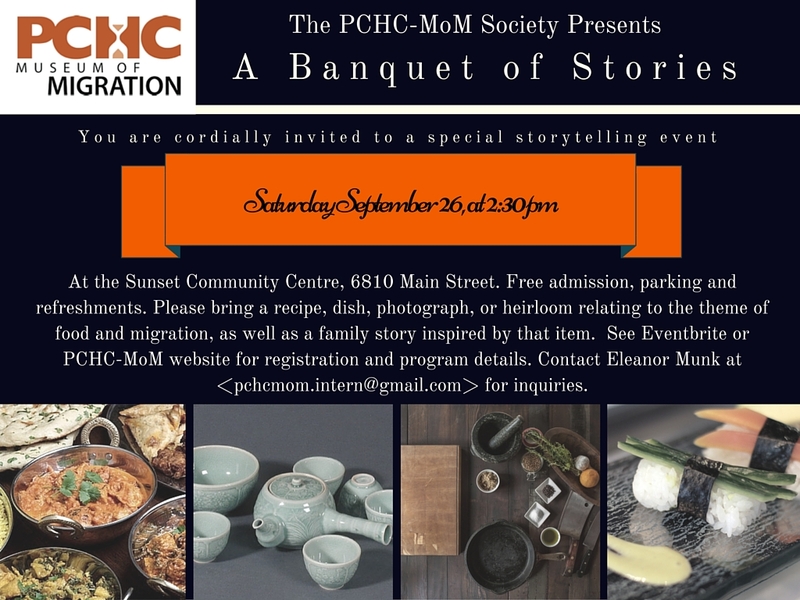 We will conclude this season of community outreach programming with a FREE participatory event — A Banquet of Stories: Sharing Migration Tales Through Food — on Saturday afternoon, September 26 at the Sunset Community Centre. We will bring our diverse networks together to build the foundation of a future museum by sharing family migration stories inspired by food, and reflecting on our connections with First Nations people and with other immigrant groups. Our goal is to collect and record family stories to begin the museum’s process of recovering ignored, suppressed, or forgotten histories. For details and registration, please see program below. Free admission. Limited seats. Pre-registration required on Eventbrite. Roaming video cameras will record story presentations; free refreshments will be provided. Selected stories will be chosen to be preserved in the future museum of migration. Free parking is available at the Sunset Community Centre. Enter from 52nd Avenue. Please bring a family recipe, dish, photograph, or heirloom relating to the theme of food and migration, AND a story inspired by this item. There will be NO cooking demonstrations at this event.